Only a tiny fraction of the world’s knowledge systems are captured in books or other forms of visual and oral material, and the internet – for all its democratic, emancipatory potential – further skews what we use as knowledge every day. Google estimated in 2010 that there are about 130 million books in at least about 480 languages. Of these, only about 20% are freely accessible in the public domain and 10-15% are in print. In a world of 7 billion people speaking nearly 7000 languages and dialects, we estimate that only about 7% of those languages are captured in published material; a smaller fraction of the world’s knowledge is converted into digital knowledge; and a still smaller fraction of that is available on the internet. We’re piloting resources and methods for centering the knowledge and expertise of marginalized communities on the internet, starting with Wikipedia’s online knowledge repository. As one of the world’s most visited websites, Wikipedia is a good proxy for knowledge on the internet more broadly, and we know that Wikipedia is not representative of the knowledge of the world. Using Wikipedia as a proxy indicator of freely available online knowledge, we know that only 20% of the world (primarily white male editors from North America and Europe) edits 80% of Wikipedia currently, and estimate that 1 in 10 of the editors is self-identified female. 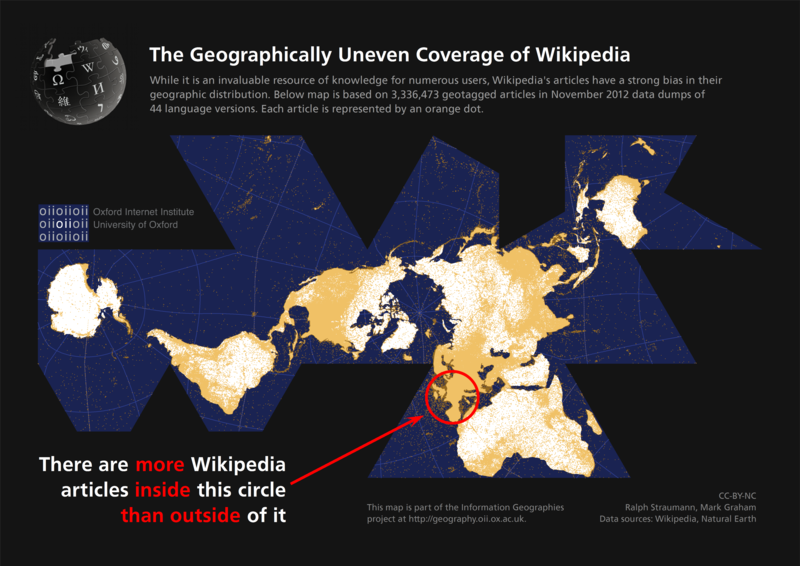 Studies by Mark Graham and colleagues at the Oxford Internet Institute have found that 84% of Wikipedia articles focus on Europe and North America, and most articles written about the global South are still written by those in the global North, so that even where content is present, skewed representations remain. Communities, like the Dalits from India and the US, queer feminists from Bosnia and Herzegovina, and Kumeyaay Native Americans, have led the way in mapping their own knowledge to find critical gaps in Wikipedia, and then creating and improving related content to fill those gaps. We support and amplify these efforts and look for new opportunities to build alliances and create space for other communities online as well. Who participates in the production of knowledge? How can we diversify our sources?